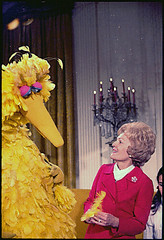 The New York Daily News reported today that Mitt Romney has stated that if he is elected President, Big Bird is going to have to do his own commercials. “Sesame Street” currently has a constellation of public and private sponsors. Corporate sponsors of the program include Beaches Family Resorts, Earth’s Best organic foods, PNC, United Healthcare and the Good Egg Project, according to the website of Sesame Workshop, the nonprofit educational organization that produces “Sesame Street.” Taxpayer support for the program comes from the Corporation for Public Broadcasting and the U.S. Department of Education, among others. This is not an endorsement of Mitt Romney. It is, however, an illustration of the difference in thinking between a businessman and a politician. I bought two of my granddaughters counting Ernie’s for Christmas. Someone made a profit on them. Someone made a huge profit on tickle-me-Elmo a few years ago. Why can’t those profits support Sesame Street and other PBS programming? Why shouldn’t the Public Broadcasting Service have to find a way to make its programming profitable? Entertainment Weekly reported yesterday that Sesame Street is going to introduce a character to acquaint young children with the concept of poverty and hunger. Good grief. Can’t we let them be children for a few years? The special will share the stories of real-life families to raise awareness of hunger issues in the United States, as well as strategies that have helped these families find food. The United States Department of Agriculture estimates that 17 million American children — nearly 1 in 4 — have limited or uncertain access to affordable and nutritious food. Walmart is sponsoring the show as part of a $1.5 million grant toward the initiative and holding screenings in select communities. The concept of food insecurity is going to be spotlighted in this one-hour Sesame Street primetime special, Growing Hope Against Hunger. I am not unsympathetic to the problem of hunger in this country, although I wonder why it exists. We spend billions on food stamps to deal with the problem, where does the money go? I do have a problem with the idea of throwing this information at young children. Children do not have the same understanding as grown-ups as to the challenges of adulthood. To me, this is exposing young children to something that will make them fearful–I can’t imagine it having any other effect. Compassion is something children learn as they grow up. Showing images and stories of children who are hungry does not engender compassion–it just causes children to worry if this will happen to them. They are children.!! !